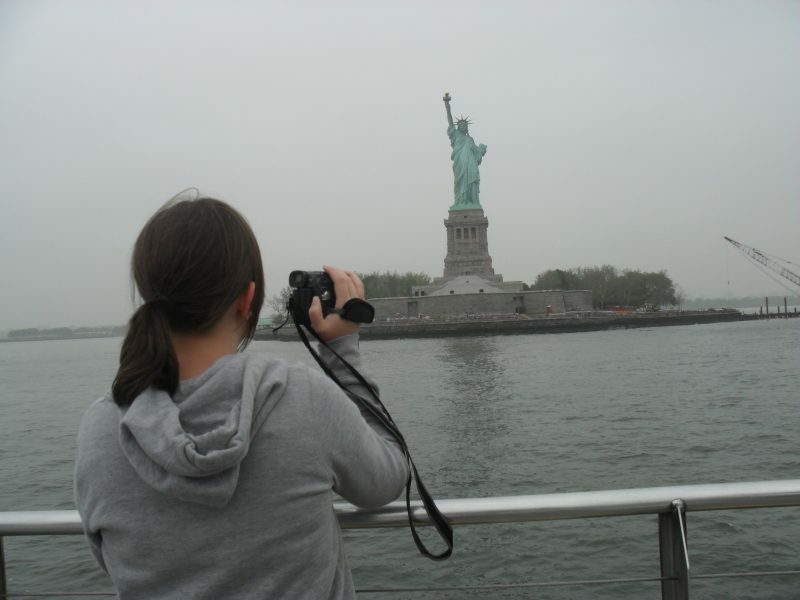 New York, New York – so good they named it twice! I’ve been three times in total and still haven’t managed to do everything. I’m hoping to go back for my birthday in a couple of years, and am already planning things that I am yet to see. Planning is key! If you’re looking to go, you’ll need to do your research. Look at the places you want to see and the areas they’re in. If you don’t, you’ll be covering the same ground, going back and forth areas and wasting loads of time that you may not have to spare. With that in mind, I’ve put together a quick guide on some of my favourite things to do in the city. It was incredibly hard to narrow them down to just ten, to be honest but if I didn’t limit it to ten things, this article would go on forever. Here we go. You literally have NO idea how much I love these tours! Wherever I go in the world, I will hunt these people down. I swear by them. This is the best way to see a city – fact! Especially if you haven’t got much time to spare. Although I was here for the week, I still wanted to see the main highlights and this bus tour had it covered. I cannot recommend these tours enough. 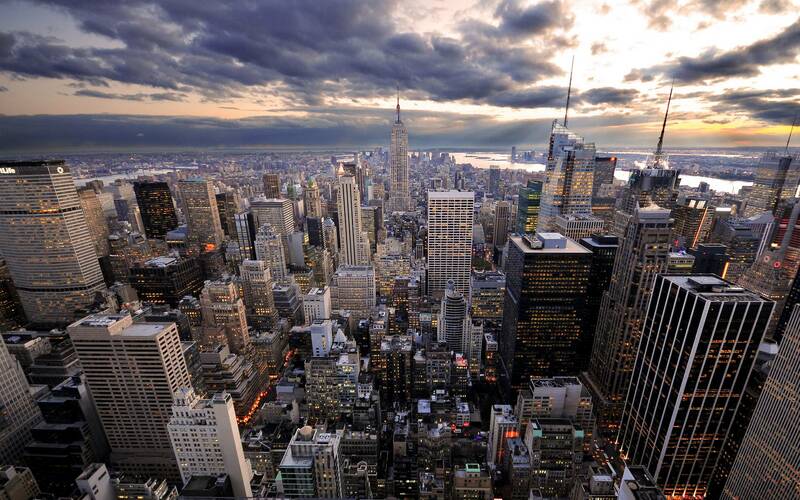 If you’ve never been to New York before, seriously this place is huge. It’s surprising how much time you can waste walking to and from places. Everywhere is so spread out. When you ask for directions and someone tells you it’s ‘just 4 blocks down’, it’s not like walking a couple of streets. These blocks are massive! 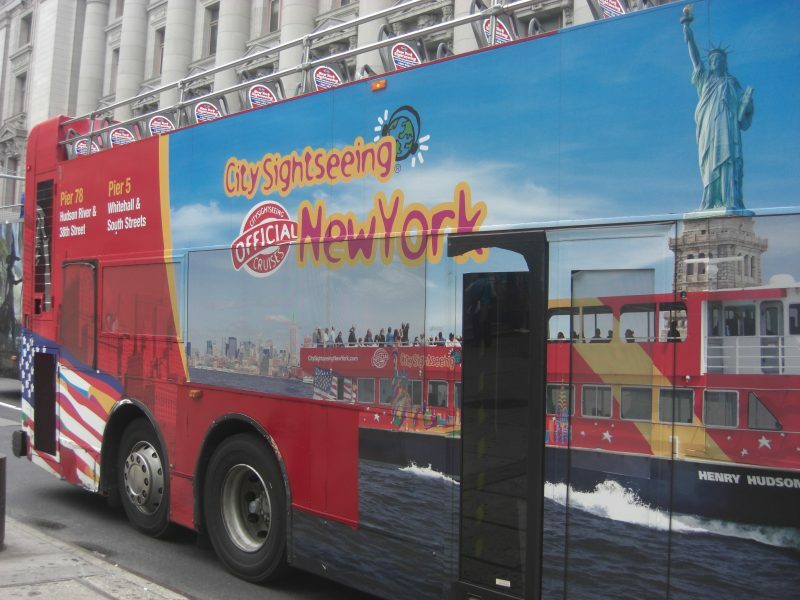 There are a few of these city sightseeing tours so check out the maps to see which areas and points of interest they cover. They’ve got ones that take you around Bronx and Brooklyn and there’s even a tour you can take by night. I chose the Uptown and Downtown tours which I did by day. 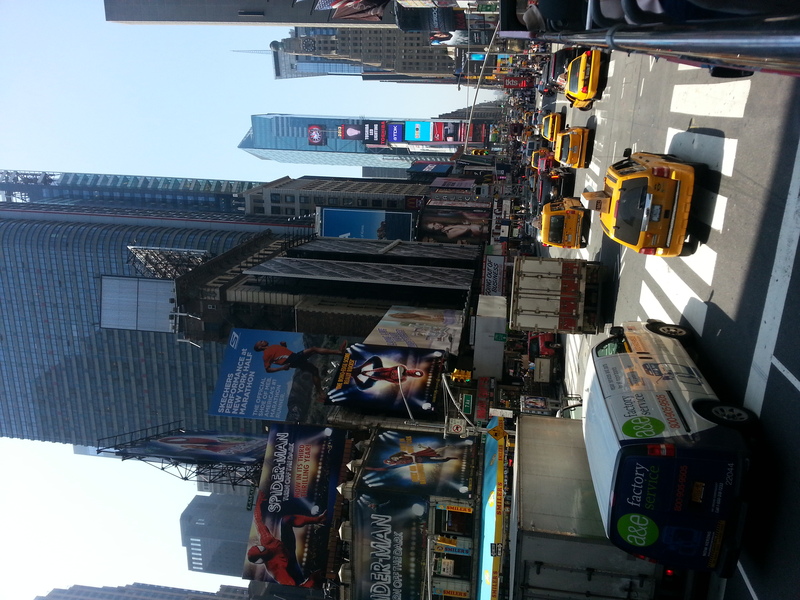 I’d never seen any of Uptown New York so that was definitely a change from the previous twice I’d been. It’ll take you past the Apollo theatre and up as far as Central Park too. As I just mentioned, New York is huge – and so is Central Park. I’d never been here before and wanted to make sure I saw all the highlights. There’s no way I would have been able to walk around the whole place, and besides – I wouldn’t have known where the famous landmarks were. I figured that the only possible way for me to condense the best bits of the park was by horse and carriage. Before anyone says it’s cruel, it depends on which sort of tour you go on, I guess? Rest assured, the guy in charge of the horse was questioned thoroughly about how the horses were kept and its general well-being. This was a guided tour which was great as all the best bits were pointed out to me. Here you’ll see the fountain from the opening credits of Friends amongst many other landmarks you’ll recognise from TV and film. 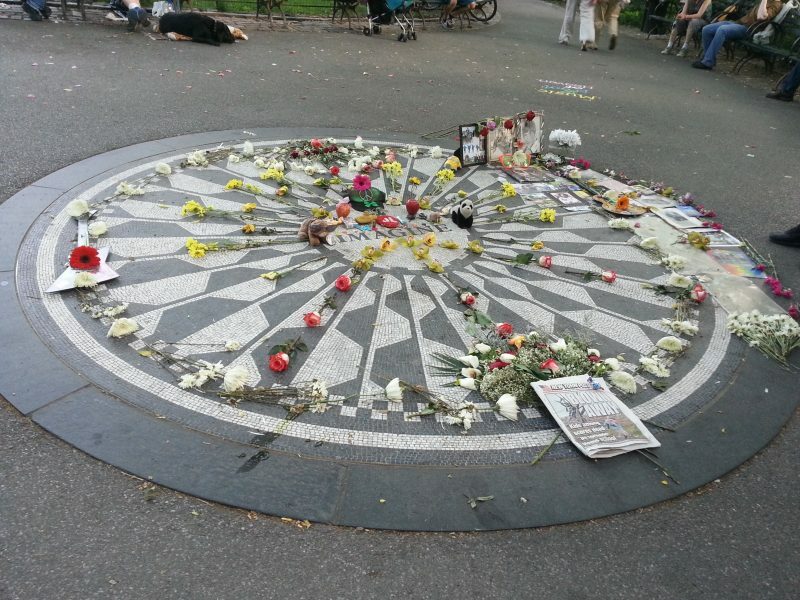 Be sure to visit the ‘Imagine’ memorial in memory of The Beatles star John Lennon who was tragically assassinated in a hotel which overlooks the park. In fact, you can see it across the road from this memorial. Most people will want to go to the observatory deck at the top of the Empire State Building, just to say that they have been to the top of one of the world’s most iconic buildings. I did that back in 1998 when I went first, and as amazing as it was, I was a bit disappointed. Mainly because you cannot get a clear view of the skyline due to the mesh nets that are up to prevent people from falling off the top or throwing things down to the streets below. Of course, that doesn’t mean you shouldn’t go there. I’m just saying it’s not the best place to go for views especially when you’re an avid photographer like myself and want to take the best shots. 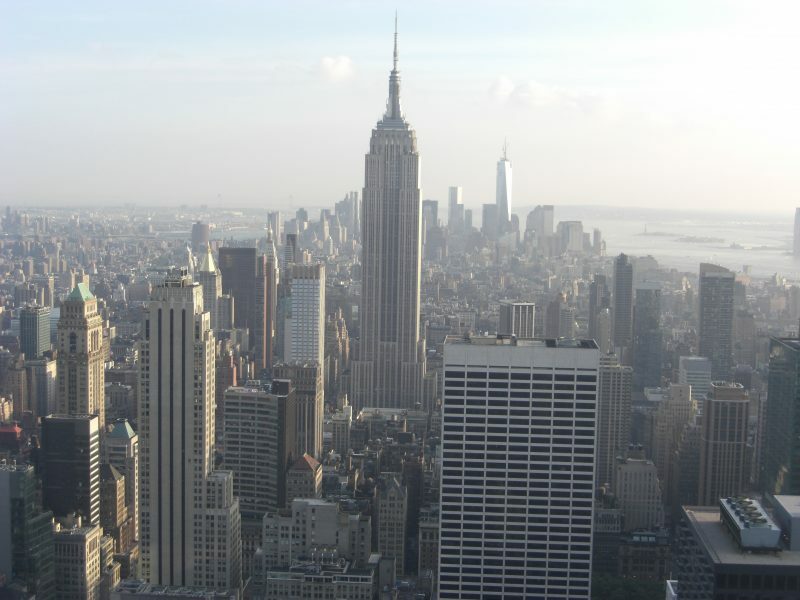 So if you’re looking to get the best view of the skyline, then you definitely have to go to the Top Of The Rock observatory at the Rockefeller Centre. If you’re afraid of heights, this might not be for you. There are 3 different decks to choose from which are situated on the 67th, 69th and 70th floor. The 360-degree view of the city isn’t obstructed with any mesh or barriers which allow you to take some amazing photos through the glass. So if you’re lucky enough to have a clear day like I did, you’ll be able to see far and wide. Just to give you a rough idea of distance, between the ESB and the One World Trade Centre (which is in the distance to the right) is 3.2 miles. This would take you just under an hour to walk or by cab it’s around 20 minutes (if you’re lucky). 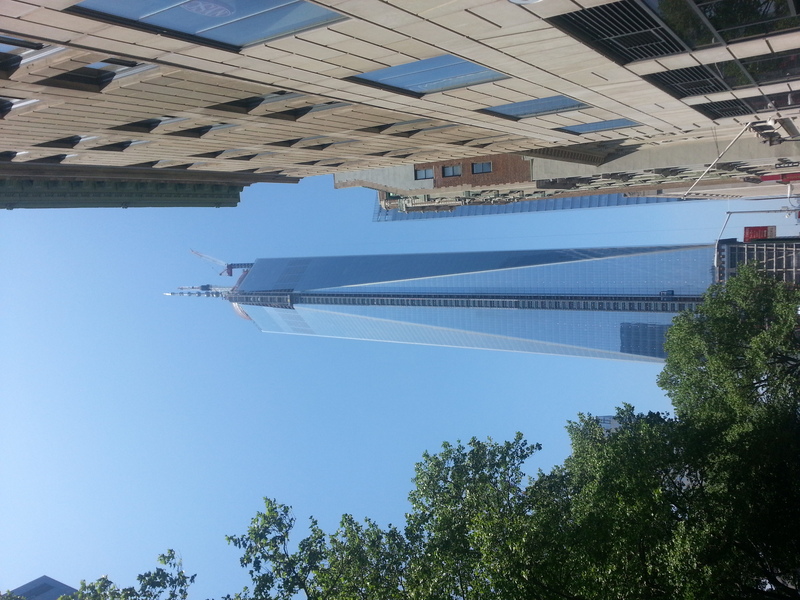 When I was in NYC back in 2013, the One World Trade Centre was still under construction. If you look closely in the photo, you’ll see a crane at the top right-hand side of the photo. I was hoping that it would be open by the time I went as I wanted to take a look at the observatory deck and see the skyline from the other side. This is now open which means I will have to add this to my ‘to do’ list. As it wasn’t open at the time, I visited the memorial where the trade centre once stood. Having seen the Twin Towers during my first visit to NYC back in ’98, now seeing the space they once were is quite overwhelming. Naturally, the area is heavily guarded and you have to go through like an airport security system to go to the site which I totally didn’t mind. Who can blame them for being extra cautious after something so horrendous? It’s one of those places where you have to go and see just to reflect on what happened. It is quite emotional especially when you read all the names of the people who died in the attack. The place is eerily quiet despite the surrounding areas being incredibly busy with the hustle and bustle of the city. It’s free to get in but they do rely heavily on donations, so if you do visit – please donate! While you’re down in the same area as the One Trade Centre, hop on the water taxi. It’ll take you on a trip past the skyline and more importantly the Statue Of Liberty. The weather was pretty crappy when I went on this, but I was still able to see the statue clearly. Unfortunately, we were unable to get off and see the statue up close due to it being closed for restoration work. I visited a few months after they had a hurricane which caused some damage to the area, so it was closed for maintenance and wasn’t safe for the public to visit. I had already been up close during my visit back in ’98 so I wasn’t too disappointed. I would recommend that you go take a look up close. You can even climb the stairs inside and look out through the crown. Not many people know that but if you look closely at the crown of the statue, there are windows and it’s a pretty cool view to look out from. Who doesn’t love shopping? Well, I suppose some people don’t, but I do. 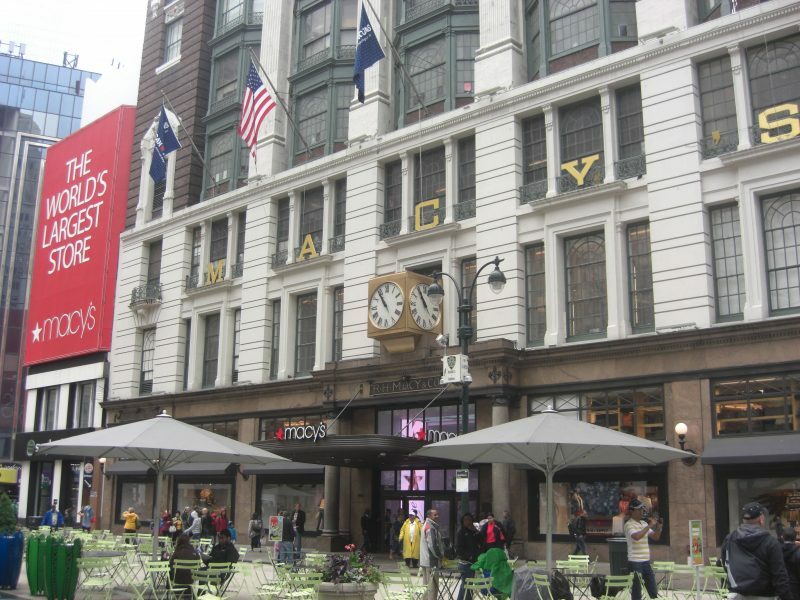 Macy’s was down the road from the hotel I was staying at, coincidence much? A trip to New York wouldn’t be a proper trip without visiting the world’s largest and most famous store. I have visited the store three times and haven’t seen it all. It would be quite interesting to see how long it would take to see everything in there. Macy’s is basically like Selfridges in the UK, just bigger and better! Don’t get me wrong, the stuff in there is expensive but you can get some good deals if you’re lucky. If you happen to be there around Christmas time the decorations they have in there are insane. Definitely worth a visit when it’s freezing outside but be warned, the majority of the NYC population will have the same idea. One of the many things most people associate with the city is Times Square and it’s where they hold the ball drop event is held on New Year’s Eve. Probably one of the many places you’ll see most yellow cabs in one area, it’s a major commercial intersection plastered with the latest, biggest and brightest billboards you’ll ever see. For the full effect, visit the square by night. They’ve usually got some sort of events going on here at any given time. Here’s where you’ll see loads of people dressed up in numerous character outfits, but be warned – they will want to be paid if you take a selfie with them, or even if they catch you taking a photo of them as they walk past. Not JUST a train station, this place is unbelievable. There have been so many films and TV shows shot in the terminal, from The Avengers to Gossip Girl, you can see why production companies use this as part of their set. The open space and architecture inside is stunning. Accessible by bus, subway and train, this is one of the biggest and busiest transport connections in the city. 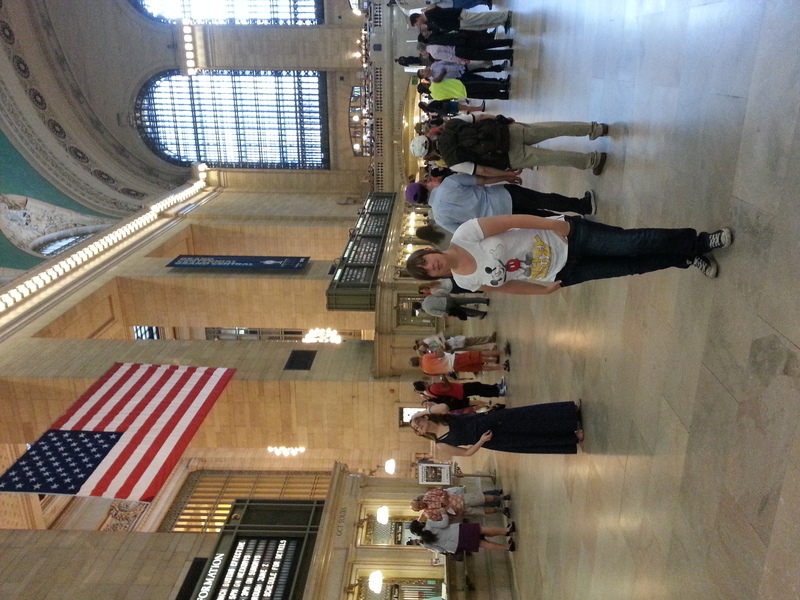 It was also a perfect opportunity to sing the line ‘sometimes I feel like I live in Grand Central Station…tonight I’m takin’ no calls ’cause I’ll be dancing’. 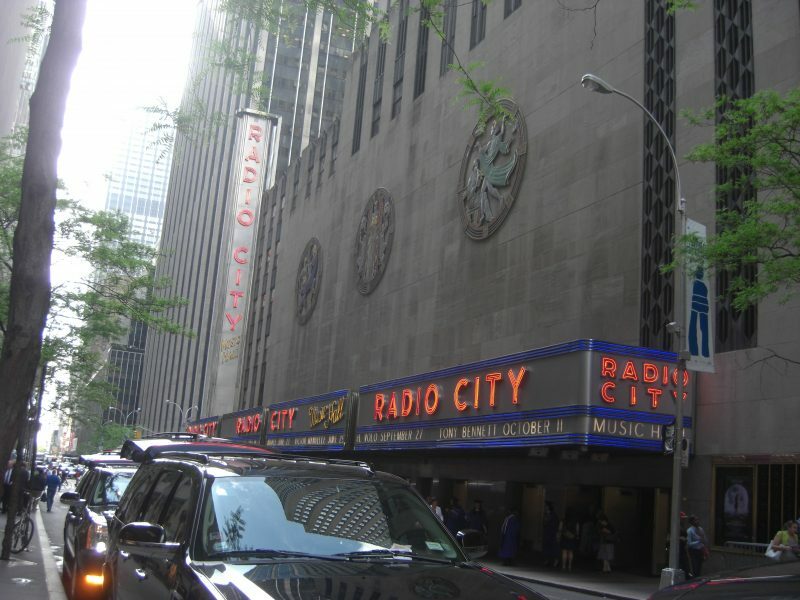 I love all things entertainment related so knew I would appreciate going to the Radio City tour. It was great to have an insight into how the music hall formed in the early 1930s and how it provided high-class entertainment to the masses. Back then, it was a place where films would be premiered and even to this day has been used for feature runs of films such as the Harry Potter series. When I was on the tour, there was a graduation ceremony going on at the music hall. How amazing is that, graduating on the same stage which is usually occupied by some of the biggest names. It was cool to see where the Grammy’s, Tony Awards, and where MTV VMA’s have been held. This tour will show you exactly where some of the best programmes are filmed. 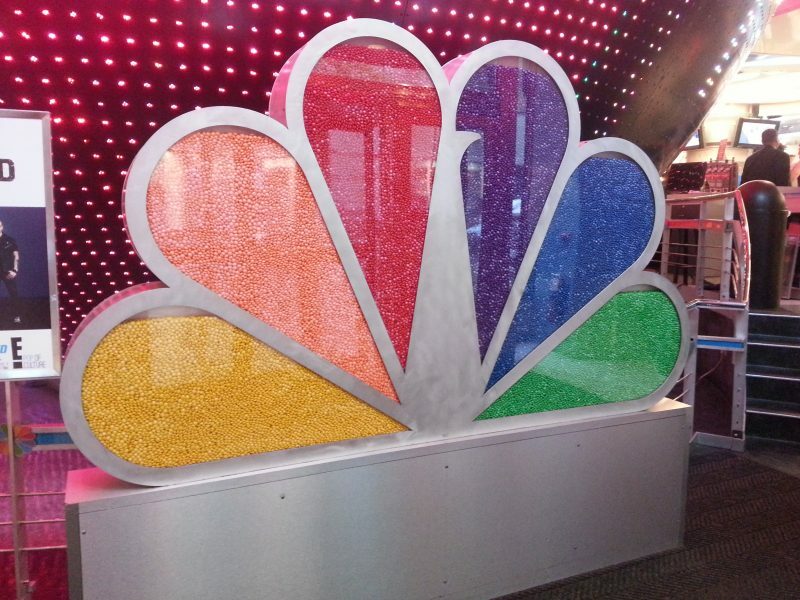 From Saturday Night Live to the Tonight Show With Jimmy Fallon, you’ll get to go behind the scenes and learn about the whole TV production process in the meantime. I always remember going to the TV and Film museum when I was very young, and it was then I developed an interest in media production. If you’re interested in seeing where these programmes are made and how this is a definite must while you’re here. So there you have it, 10 of my favourite things about the city. I would also recommend going to see a show on Broadway if you’re into musicals. I saw ‘Wicked’ and I preferred it to the production in London. I’ll stop there now though because technically I have mentioned 11 things and that’s cheating. I hope that anyone who’s thinking of travelling to New York or planning to go will find this useful. Why is this whole clown trend is a terrible idea?